Beguiling, international Amara claims roots from Africa to Romania and beyond. 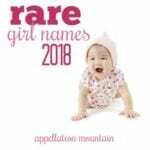 Thanks to Laney McDonald for suggesting our Baby Name of the Day. In Igbo, a language spoken in Nigeria, it is literally the word for grace. I can find the name, as well as names where it occurs as an element, on Nigeria websites. What’s less clear to me is if it’s traditional, modern, or somewhere in between. Amar means immortal in Sanskrit; add an ‘a’ and this could easily be the feminine form. In Greek, amarantos means unfading. It gives us the name of the amaranth flower, as well as feminine given names Amarantha and Amaranta. The Latin amor or amare – love – could also be a source. Add an ‘h’ and it’s a city in Iraq, founded by the Ottoman Empire in the nineteenth century. In Italian, it means bitter – think of the liqueur amaretto. In Paradise Lost, John Milton mentions Mount Amara. It’s based on a real mountain, likely mis-named by early European explorers. In Romania, there’s a large salt lake by the name, known for its healing properties. More possibilities exist, and while they’re tough to confirm, there’s a good chance I’m missing at least a few bona fide origins. But here’s the thing: it’s not about the name’s origins. The name debuted in the US Top 1000 in 2000; it was virtually unknown in the US prior to the 1960s. Amara owes its success to pop culture. There’s a member of the X-Men, Magma – real name Amara Juliana Olivians, a native of the fictional Nova Roma. The character debuted in 1985, and there’s a corresponding jump in the name’s use. Then came Sailor Moon. The Japanese manga debuted in the 1990s and arrived in the US not long after. But it didn’t catch on until the animated series starting running on Cartoon Network in 1998. Sailor Uranus is Haruka in Japanese; Amara in English. I’m not certain exactly where the Sailor Moon character appears in the series, but the timing seems right. The superheroes combined to tip the name into the US Top 1000. Still, two relatively minor characters alone don’t explain the rise of the name. A handful of multiple minor uses throughout the last decade or so helped. Bulgari released a fragrance called Aqua Amara, introduced in 2014. A handful of international celebrities and movies followed, too. The biggest boost may have come from The Vampire Diaries. Season five debuted in 2013, introducing us to the very first immortal woman – Amara. Series lead Nina Dobrev played the part, as one of many incarnations of her main character, Elena. While the character appeared in only a handful of episodes, it seems to have had an impact. Between 2013 and 2016, the name more than doubled in use. It now stands at #208. 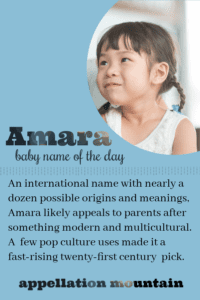 With truly international roots and multiple, positive meanings, Amara is likely to appeal to many parents. While pop culture pushed it into the mainstream, it doens’t feel overly tied to any fictional universe. If you’re after a name that’s modern with roots, and feels at home across many cultures and languages, Amara is one to consider. What do you think of Amara? Will it continue to catch on? Originally published on September 30, 2019, this post was revised substantially and re-posted on January 23, 2019. My name is Amara, a 33 y/o female that has always had compliments on my name. The only draw-back to this name is people have ALWAYS mis-pronounced my name. (Not that big of a deal, you get used to it after awhile) I’m very happy with my name. I kinda like thinking that I’m the only female with this name. it makes me feel like I’m an individual, not like Barbara, or Sarah. 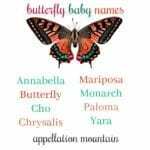 Not that those aren’t lovely names as well. Anyhow, just thought I’d leave my reply…..
Isn’t Amara a short form of the ancient Greek name Amaranta? I stumbled upon this name in Garcia Marquez’ One Hundred Years of Solitude and find it quite lovely. Have a girl named Amia (Ah-my-ya). Guess it’s close??? Love the name. I hear it’a French for BELOVED. Fits my daughter. I love her and her name. I agree that Amara is pretty but dull: not a good beginning for a potential daughter. It flows off the tongue with pleasant rhythm, then I start mis-remembering syllables. It also reminds me of Inara, from Firefly, which is a nice connection. Amara is ok, it does remind me a bit too much of the French word for bitter amer. I prefer the Basque Amaia, which feels somewhat similar. The nicknames Mara or Mary are nice nickname options to Amara. Amara is a pretty sounding name, but slightly bland for me, personally. Interesting how it has multiple possible origins – linguistically speaking, a simple vowel-consonant alternating name is one that is most likely to have that feature (the vowel in question is featured in most languages, as is the labial m, but r is a more rare sound globally). But those kinds of ‘coincidences’ fascinate me anyway. On another note, I had a colleague with the surname Amara. I believe she once said her father’s side of the family was Italian in heritage, but I’m not certain of that. 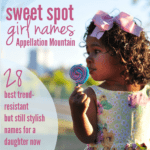 Her surname is the only place I’ve heard the name previously – I’m surprised it ranks so high on the ssa list! Charlotte, thanks! I was wondering if there was something I was missing, as none of the possible sources seemed to match up with Amara Karan’s background. And I’m glad I’m not the only one who thought Avon!